I can never make enough of these pancakes. No matter how many I bake, they always disappear. The recipe is an adaption of Martha’s best buttermilk pancakes found in this book. I have cut the salt in half, replaced the white sugar with less honey and cut the butter in half. I have made the recipe innumerous times. I usually serve the buttermilk pancakes with any combination of fresh fruits and maple syrup. Grab a smaller bowl and add buttermilk, eggs, honey and butter. Then whisk it well. Pour the buttermilk mixture into the flour mixture and stir gently until combined. The batter should have small lumps. Warm up the frying pan, melt a bit of butter and fry the pancakes your preferred size. Only a few minutes on each side. You can cut the fruit(s) of your choice while the pancakes are baking. You can top the uncooked side of the baking pancakes with eg. blueberries just before you flip them over. Try adding lemon or orange zest to the batter. If you or someone else deserves a special treat, you can add some chocolate chips too. Not bad at all. You can take breakfast pancakes in many directions. 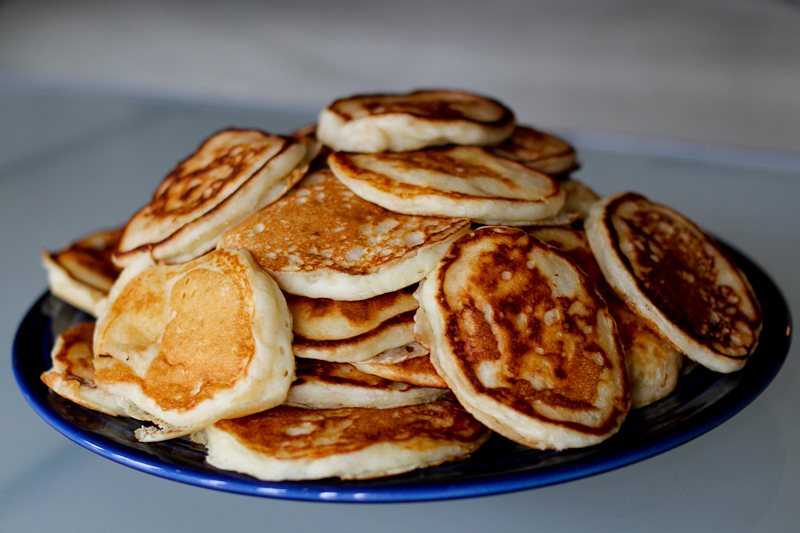 This entry was posted in Breakfast and tagged amerikanske pandekager opskrift, best buttermilk pancakes, brunch pancakes, pancake recipe, pandekager med kærnemælk. Bookmark the permalink.